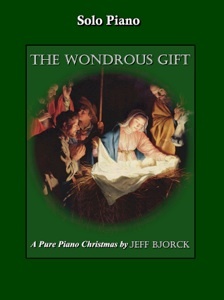 The Wondrous Gift is the companion sheet music e-book to Jeff Bjorck’s 2010 solo piano CD by the same name. 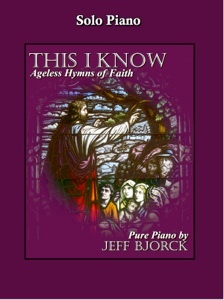 All twelve Christmas carols are included and were transcribed note-for-note from the recording (I proofed them, so I know they are as close as possible to the CD). All of the songs are at an upper-intermediate/early- advanced level and are a joy to play. Playing instructions, dynamics, pedal markings, and metronome settings are all included, and the notation is clear and easy to read. There are no reaches of more than an octave and none of the key signatures are difficult (see below). Timing is pretty straight-forward, although some of the variations alter the traditional timing a bit to give a new interpretation. 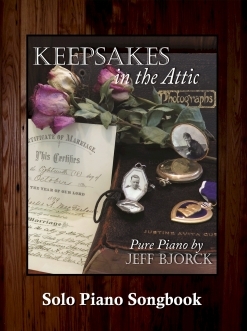 These beautiful arrangements are suitable for pretty much any holiday setting where a piano solo is appropriate. All of the songs are traditional sacred songs, and the arrangements don’t vary too far from the melodies, although some have interesting interludes within the pieces. 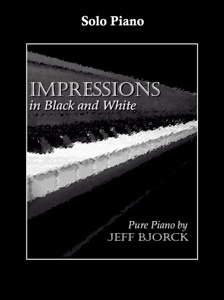 This book is available for download from www.purepiano.com. Very highly recommended!